1. DANGER- Risk of shock- Tun-Off the power before installation. 2. This luminaire must be installed in accordance with the NEC or your local electrical code. 3. Suitable for wet location and operation in ambient not exceeding 40°C 4. Min 75°C supply conductors. 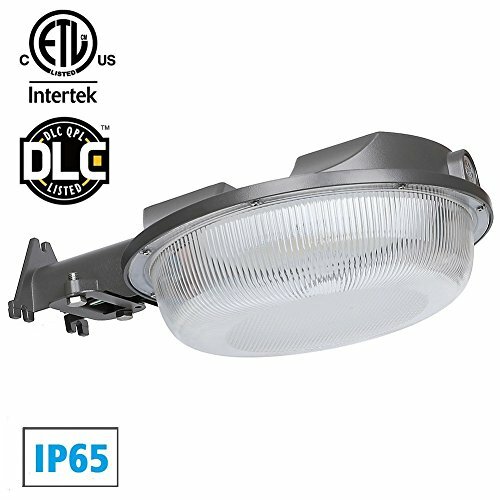 EXCELLENT PERFORMANCE - CINTON 58W LED yard light with built-in Philips COB provides stunning 6400 Lumens high output brightness to replace 550W incandescent light or 150W HID light.Saving 70% electric bill instantly. ENERGY EFFICIENT & HIGH SPECIFICATION MATERIAL -LED lights and dusk to dawn photocell saves you money by reducing energy consumption by 87% and automatically turning off during daylight hours. Also, the CINOTON Lighting LED area light with an oversized size of 13.8*9*4.3 inches and a weight of 4.1 pounds, the use of aluminum alloy materials provides excellent heat dissipation and prolongs the life and safety of LED lamps. WIDE APPLICATION -Widely installed in backyard, barns, farms, parking lots, garages and Alleyways. Works as yard light, outdoor street light, area light, security light , barn light and perimeter Lighting. EASY INSTALLATION AND UPGRADE - Easily mounts to a wooden post, pole or wall using 2" lag screws, which are included. Also, can be mounted on a 2" diameter elbow mounting arm, which is not included. Typically will fit onto your old high pressure sodium yard light mounting arm, which makes for an easy upgrade. HASSLE FREE GUARANTEED: Free 5-year product limited warranty is offered to our customers, email us for any query and we will be in touch within 24 hours. Replacement or refund will be provided for your preference. If you have any questions about this product by CINOTON, contact us by completing and submitting the form below. If you are looking for a specif part number, please include it with your message.